When did Nintendo just give up on naming things? The New Nintendo 3DS XL follows Super Smash Bros. for the Nintendo Wii U, Super Smash Bros. for the Nintendo 3DS, and a trail of Mario side-scrollers with interchangeable names. After playing the New 3DS I can see why they’d want to lower expectations about this new hardware by not giving it a new name—consumers expect a jump in technology when buying a new system, and this is more of a half-step. Still, as long as the remaining 3DS stock remains on store shelves, this vague name is guaranteed to create confusion in the marketplace. 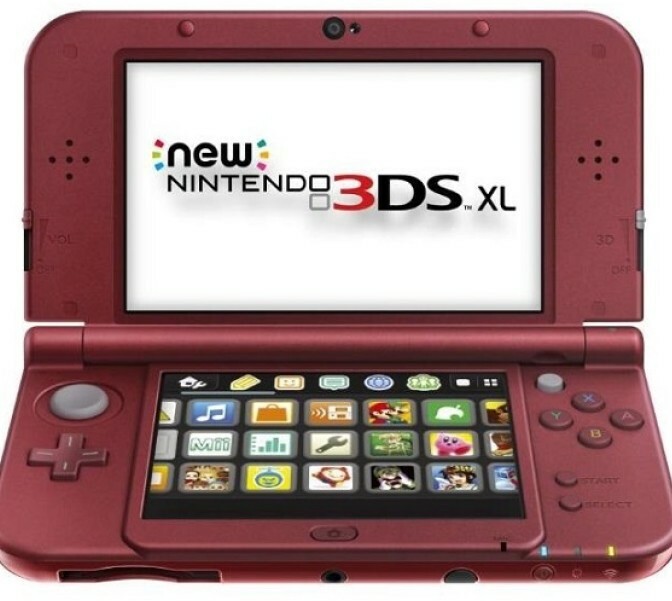 Here’s what you can expect from the New 3DS: a slightly bigger, slightly more powerful 3DS, with a few extra buttons. This isn’t merely an aesthetic redesign: the New 3DS will eventually play games that aren’t playable on the older 3DS. (The big one for fans of cult Nintendo franchises will be April’s Xenoblade Chronicles 3D, a port of a fantastic but hard to find and harder to afford Wii game from 2012.) The New 3DS adds a nub of a second analog joystick (called the C-stick) just above the four face buttons, along with two new shoulder buttons behind the upper screen. Those buttons are already coming in handy for certain games—The Legend of Zelda: Majora’s Mask 3D, which is also out today, and plays on any 3DS model, is better on the New 3DS, in part because the extra buttons makes it easier to interact with. The New 3DS is only available in the XL model, which is significantly bigger than the standard 3DS I’ve used since the handheld was released in 2011. I messed around with a DSi XL for a while and didn’t quite like it—it felt too unwieldy for a handheld—but 2010 was many years ago and now I find myself appreciating the enhanced size of the New 3DS. The bigger screens are less taxing to focus on, and a side-by-side comparison of Majora’s Mask on my 3DS and New 3DS doesn’t seem to reveal any visual degradation on the extra-large New 3DS. (In fact the New 3DS version looks a little bit better, which I’ll get into later on.) DS games on the DSi XL looked a little blown out, like when you make a JPG bigger in Microsoft Paint, but I don’t see a similar blurriness when playing a 3DS game on the New 3DS. Also perhaps the Vita has conditioned me to accept a larger handheld since I last picked up my DSi XL. I doubt the Vita had much of an influence upon Nintendo’s design, considering how minor of a footnote Sony’s device has turned out to be, but it’s hard to not think of the New 3DS in relation to it. I was one of those skeptics who thought handhelds didn’t need and probably couldn’t pull off a second joystick, but the Vita proved me wrong. Yes, Nintendo released the Circle Pad Pro add-on for the original 3DS in America the week before the Vita, but that was a weird, awkward half-measure, and not an integral design feature. The secondary C-stick nub on the New 3DS isn’t a real joystick—it’s much smaller and stiffer than the Circle Pad Pro—but it serves the same basic purpose. It’s surprisingly responsive considering how small and stiff it is; it controls the camera in Majora’s Mask 3D, twirling it around Link whenever I apply minimal pressure. I synced up Majora’s Mask 3D on both my original 3DS and my New 3DS to see how the two systems compared visually. (This required two copies of the game—transferring data from an old system to a new one wipes everything off the old system.) The New 3DS didn’t seem like a big leap forward. Link and Skull Kid’s figures had the same slight amount of jaggedness around the edges, which probably has something to do with the fact that the original game dates back to the Nintendo 64. The color palette for the backgrounds seemed a little richer on the New 3DS. The opening vignette, with Link riding through a creepy, fog-shrouded forest, was a dull blue on the original 3DS, but had an eerie, unearthly green hue within the blue on the New 3DS. The colors were the only recognizable difference between the two, and although it wasn’t that significant, the images on the New 3DS were more arresting. I did immediately notice that the 3D effect is better on the New 3DS. I cranked the 3D slider all the way up on both systems when doing my side-by-side comparison, and the 3D looks a little deeper on the new system, with a bit more distance between objects on the screen. More importantly, the 3D effect remained more consistent as I moved the New 3DS around. I got far less of that annoying, eye-hurting blurriness that happens when you move the original 3DS even slightly. During my test I would look back and forth at both systems; I’d always have to wait a second for my eyes to readjust to the original 3DS, whereas when I would look back to the New 3DS I would usually see the 3D effect right away. I’m still not sure if I’ll use the 3D all that much, but it’s definitely improved on the New 3DS. If you own a current 3DS, you can transfer all your data to the New 3DS. It’s a convoluted process that makes you bounce back and forth between the two systems. Also the New 3DS only uses microSD cards, which hold less data than the SD cards used by the 3DS, which makes everything even more complicated. There’s an option to save space by not transferring downloadable games, which are unlocked and can be downloaded again on the New 3DS, and a makeshift solution that involves using a PC to break the SD card’s content up across several microSD cards. Transferring data also complete wipes everything from the source machine, and copies over anything on the 3DS you’re transferring to. The weirdest thing about the New 3DS is that it doesn’t come with an AC adapter. It uses the same type of adapter as every DS model stretching back to the DSi, so Nintendo just assumes you already have one or two lying around the house. Like the confusing name this is another decision that will drive many parents crazy. We can all look forward to stories of kids crying on their birthdays or holidays when they get a New 3DS but can’t play it because their parents didn’t know to buy the AC adapter that’s sold separately. It might save Nintendo a few bucks and take up less space on already overburdened retail shelves, but selling a device without the crucial piece that lets it run is kind of negligent. Hopefully decisions like that won’t give the New 3DS a bad reputation. It’s a good improvement on the 3DS, even if it’s not a big jump forward. The C-stick is a valuable addition, and it’s already making a game like Super Smash Bros. for the Nintendo 3DS more fun to play. The smoother 3D could make the system’s namesake calling card into a legitimate core feature instead of a weird novelty. And although Nintendo’s policy of releasing incremental handheld upgrades for full price instead of waiting for a full-fledged new system might seem costly and confusing to some, it’s not that different from what tech companies do with smartphones and tablets. The New 3DS is a better 3DS, even if the advances aren’t highlighted and underlined with red ink.